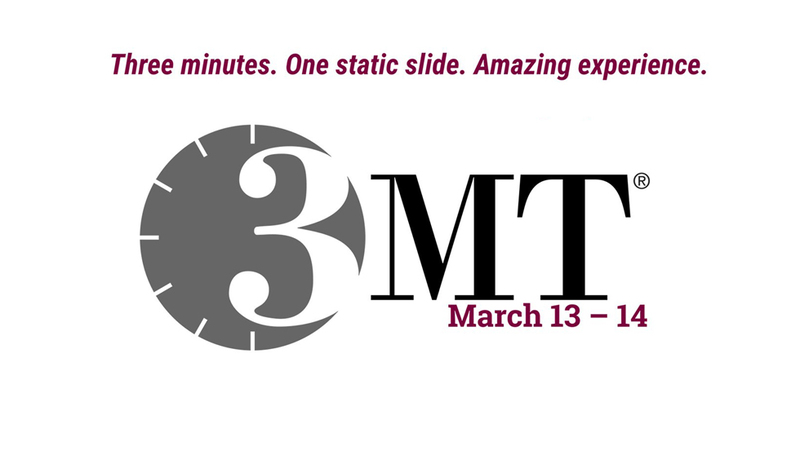 Explaining years of research in three minutes or less is the challenge for graduate students participating in McMaster’s 2019 Three Minute Thesis (3MT) Competition, happening March 13 to 14. The 3MT is an opportunity for current graduate students to share their work beyond their faculties and disciplines – it’s a chance to let the world know about the important and innovative research contributions made by McMaster’s graduate community. The competition also provides an opportunity for students to refine communication skills that can be transferred to diverse careers, within or beyond academia. Graduate students who want to take part in this year’s 3MT must register no later than February 25, 12 p.m. Completed slides and final presentation titles are not required at time of registration. Six preliminary heats run throughout two days of competition, with winners of each preliminary heat competing in the final at 2 p.m. on March 14. All heats take place at the Concert Hall, in the LR Wilson Hall. receive the Dean’s Award for Excellence in Communicating Research and a cash prize. Second and third place will receive cash prizes, and second through fifth place winners will receive the Dean’s Award for Excellence in Communicating Research. All 3MT participants competing in or attending the Final, are eligible to vote for the Competitor’s Choice, awarded to a Final Heat presenter. Wondering what a 3MT looks like? See past Three Minute Thesis presentations on the School of Graduate Studies YouTube channel. For students interested in participating in the 3MT, an upcoming workshop. Authentic, Engaging, Clear: Your Thesis in Three Short Minutes – is happening on Thursday, February 14, 5 to 7 p.m.